Distance Learning Law School | 8x8, Inc. The study of law is one of the most demanding academic pursuits. Although analyzing case law and dissecting the minute details of statutes requires a great deal of solo study, distance learning in law school risks missing out on the back and forth classroom discussions that are central to a legal education. Law school success requires intelligence and the ability to learn and retain vast amounts of information. Much of this type of study works well in a distance learning environment since law school is often remarked as three years of intense reading and writing. Both reading case law and writing briefs are individual pursuits. Equally important to understanding the law, however, is developing skills in debate and extended interactive analysis of legal issues. An effective law school distance learning program should combine the rigors of individual study with numerous outlets for interaction with professors and fellow students. Although law schools have existed in the United States since colonial times — William and Mary, for example — it once was quite common to study to become a lawyer without attending an accredited program. "Reading the law" was an accepted method of becoming a lawyer up until the late 19th century. This practice involved intense individual work, often under the wing of a licensed attorney. Law schools eventually became the preferred, and in most states the only, method of gaining permission to sit for the bar exam. For over a century, law students followed a rigid path to a law degree and few programs provided flexibility. The standard program required three years of intense study in a classroom setting. Today, the growth in online learning programs has challenged the tradition by allowing students to work more independently and from afar. Can the Socratic Method Thrive Online? Those who have studied the law, or have seen dramatic examples of legal education in movies and TV, likely have the image of a wise law professor challenging and terrifying students with seemingly unanswerable questions. This practice of teaching through questions is referred to as the "Socratic method," and it is key to a legal education. One of the main challenges with learning the law is that, while certain legal principles are settled, facts and circumstances can quickly cloud resolution. Law school trains lawyers to argue both sides, and the Socratic method drills in the fact that often there is no single answer. Professors notoriously call on a student — often just once during a semester — to poke holes in the student's argument and opinion to demonstrate the complexity of the law. For online learning to approximate classroom-based legal education, the Socratic method and other forms of slightly competitive collaboration are required. Luckily, there are numerous technological tools to enable this sort of effective law school distance learning. The business world, including the legal profession, have embraced Voice over Internet Protocol (VoIP) and Unified Communications as efficient methods of collaboration and working. Educational programs, such as distance learning law school, are following suit. VoIP systems, such as the richly featured cloud-based solutions offered by 8x8, arm educators and students with innovative methods of teaching and learning, regardless of location. Video conferencing is a sensible and effective replacement for in-class discussions. With web-based video communications, students feel as though they are all part of a unified conversation. Helpful classroom debates are enabled, and a law professor can still invoke fear in the hearts of students through the Socratic method, even if the student is far away. In addition to the classroom-specific tools that VoIP provides, Unified Communications brings much more to the table. Email, voicemail, messaging, shared documents and more can all work together, providing professors and students a single platform for classroom discussion and course administration. These tools not only make online law school possible but can also create a more effective means of learning. 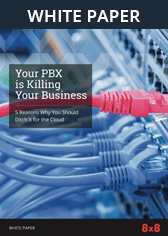 8x8's products and services are scalable and often less expensive than maintaining older limited phone systems. VoIP is great for businesses and is equally beneficial for law school distance learning.